Barnsley schoolchildren have had a visit from the UK’s leading champion of the technology of the future ‘the Internet of Things. Caroline Gorski leads the Internet of Things UK programme at Digital Catapult. She visited Barnsley to speak to a group of young people at Horizon Community College this week. The Internet of Things (IoT) is all about promoting the potential of ‘smart devices’ which connect to the internet and exchange data to carry out everyday tasks. This new technology extends the power of connectivity from computers and phones to everyday things such as kitchen appliances, security systems and energy meters. 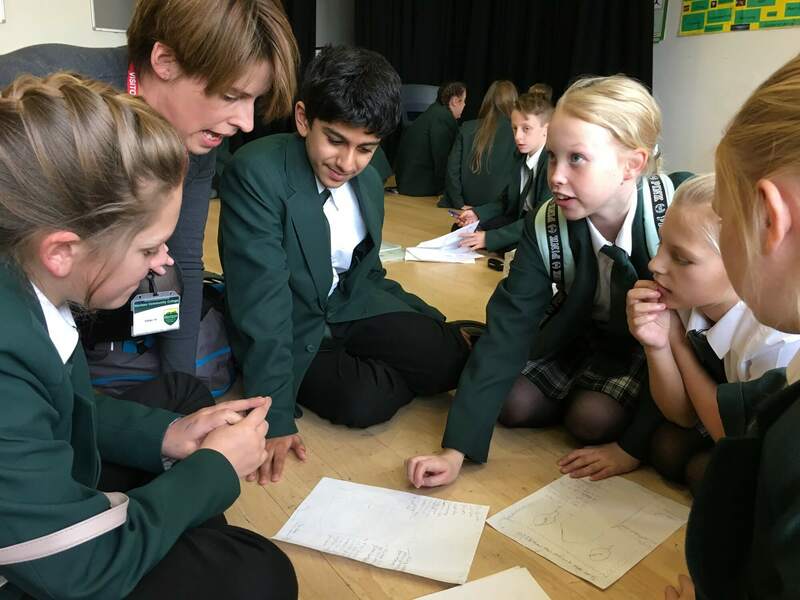 The children at Horizon, aged 11-12, are all taking part in a national competition called ‘TeenTech City of Tomorrow’, creating models of futuristic ‘smart buildings’ which will explore the endless potential that IoT and other new technologies may have to transform our lives. Caroline said: “The Internet of Things is tomorrow’s exciting technology, here today. It is already being used to create innovative solutions to everyday challenges such as managing our homes and workplaces better, providing health and social care improvements, saving energy and simply organising our lives more efficiently ‘and it has the potential to do so much more. “It was great to talk to young people in Barnsley about where this technology may take us in future and to discuss their own projects exploring its potential. The UK is a leading light in the global development of IoT and bright new ideas can come from anywhere. Principal of Horizon Community College Nick Bowen said: “There is a world out there which relies daily on the use of digital technology. Young people know this, but they don’t really understand the huge opportunities which this digital media will provide for them in terms of meaningful careers for them. Caroline’s visit was organised through Barnsley TechTown ‘a European-funded programme, led by the Digital Media Centre and Enterprising Barnsley, the economic development arm of Barnsley Council. TechTown aims to promote digital innovation, economic growth and job creation in Barnsley. The visit was also delivered in partnership with Barnsley Council’s ‘I Know I Can’ initiative, which supports young people to take part in enterprise and innovation projects, like ‘TeenTech City of Tomorrow’. Digital Catapult helps UK businesses and organisations maximise the potential of digital and emerging technologies to advance economic growth. Caroline heads up Digital Catapult’s IoTUK programme to increase the adoption of high-quality IoT technologies and services by businesses and the public sector in the UK for the benefit of citizens. In our region, Digital Catapult Centre Yorkshire, based in Bradford, is bringing initiatives and experts to help local businesses and organisations embrace digital technologies. Enterprising Barnsley, the economic development arm of Barnsley Council, provides specialist support to businesses with growth potential and runs a range of events and workshops at the town’s Digital Media Centre, home of the Barnsley TechTown project. Photograph shows Head of the Internet of Things at Digital Catapult Caroline Gorski speaking to students at Horizon Community College. IoTUK is an initiative to help advance UK competitiveness in the Internet of Things (IoT) and increase adoption of high quality IoT technologies and services by businesses and the public sector in the UK, benefiting citizens. Find out more here.